We are met today, as we are every Sunday, to offer our homage to almighty God in the greatest act of worship ever created, the holy Sacrifice of the Mass. Is there anything so sublime, so efficacious, so articulating of the love that passes between a Father and Son than this act, performed by Jesus Christ Himself, through one of His own creatures, a priest? Today we come together for another purpose. We come together to honor a man who has been one of those priests now for twenty-five years. 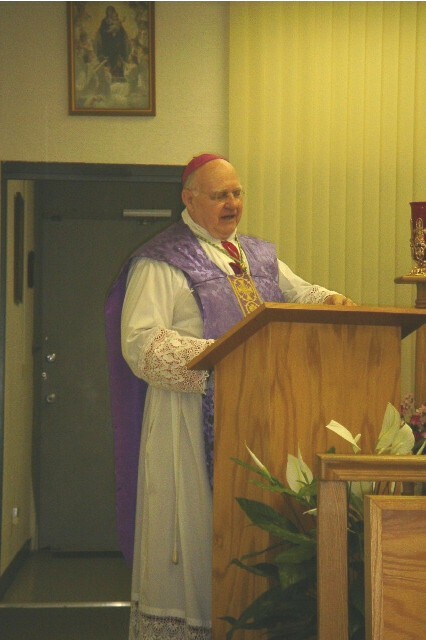 We call this occasion Father Charles T. Brusca’s Silver Jubilee. Jubilee come from the Jewish word jobel, which has reference to a ram’s horn. Now that word comes through a transition, first from the Greek and ultimately to the Latin jubilo, meaning “to shout.” So, we have come today to sound the ram’s horn and to shout in jubilation over this wonderful work that God has wrought in a man. Let us look at some of Father Brusca’s accomplishments during these past twenty-five years: By my reckoning, Father Brusca has offered - perhaps we ought to use the word “celebrated,” for this occasion - something in the area of 10,000 holy Masses. Imagine that! He has prayed for us and for some special purpose or person that many times again in those Masses. Knowing Father Brusca as I do, I am sure we can add at least that number of recitations of our Lady’s rosary, and that would be fifteen decades, not five. It would be impossible for me - from my distance in Father Brusca’s work -- to calculate the number of confessions he has heard, the number of sermons he has preached - and each one carefully prepared and true to Christ’s teaching, the number of Baptisms he has performed, or the marriages he has witnessed. The numbers soar, the vineyard has been blessed, for the laborer has done his job well. Now, you may be sure that this alter Christus has not been a reed shaken by the wind, no more than was our Blessed Lord’s cousin Saint John the Baptist. No, he has heard the word of God and he has kept it himself, and he has taught it to you. What you have seen is what you have gotten, one who has not been afforded the soft garments that we find in the houses of kings. Now John will know. John is well aware of Jesus’ almighty power. He is after all, our Lord’s Cousin. These men have grown up together from childhood. They have a united mission. In a kind of sequel to what we find in today’s Gospel, we will visit that of Saint John the Apostle, next Sunday, to hear the Baptist’s own words concerning this Cousin, Whom he knows so well. “In the midst of you there has stood One, Whom you know not. He it is Who is to come after me, Who has been set above me, the strap of Whose sandal I am not worthy to loose.” Oh, John knows Who Jesus is. He knows exactly. He wanted to hear his disciples bring back those words to him, “the poor have the Gospel preached to them.” In this John and Jesus are exactly alike. They have come to help all men - all who will listen to the words of eternal life that will be inspired in both through God the Holy Ghost. John’s mission is to preach repentance for sin and to pave the way for the Baptism, together with the other six Sacraments that our Blessed Lord will sanctify in His ministry in the not too distant future. John’s mission is ending. Our Lord’s public ministry is just beginning. From both, your pastor has been teaching the same ministry, lo these twenty-five years. He has been preaching the repentance of Saint John, and he has been preaching to the poor in spirit who have made their way to this house of God, where his ministry has paralleled that of Him of Whom he has been the other self these twenty-five years. Today, in honor of this auspicious occasion, perhaps it is fitting to see some soft garments, those fine garments that are found in the houses of kings to celebrate the unique dignity and beauty of the Silver Jubilee of a priest of God. But, as we are now in the penitential season of Advent, our liturgy does not permit us that finery, even for this occasion. Rather, in keeping with the season, we assume the penitential purple, leaving the soft finery to honor God Himself and His most holy Mother, perhaps next Thursday, when Father Brusca himself will assume more fitting garments to remember the time when he assumed the person of Jesus Christ in holy Mass solemnly for the first time on December 8, 1980. Father Brusca was ordained, by me, on the feast of Saint Nicholas, December 6, 1980, and offered his First Solemn High Mass two days later, on the Feast of the Immaculate Conception. There was some finery, dare I say, “soft garments” for the occasion. But let us not lose sight of the fact that every valid Mass is identical in efficaciousness and every Mass has the same infinite value, whether it is offered by a pope or the poorest priest, in the greatest cathedral of the world or on the hood of a jeep, whether one wears the finest vestments of spun gold or polyester black. The Mass is the moment of coming together in love to offer to God the Father our adoration, thanksgiving, reparation and petitions, through Jesus Christ the beloved Son “in Whom [He, the Father] is well pleased.” It is the pouring out of the only means given to us by that divine Son to offer atonement to the Father for the offenses committed, not only by our first parents, but by all of us throughout all time. “This is he of whom it is written, ‘behold I send my messenger before thy face, who shall make ready thy way before thee.’” So speaks our blessed Lord, again of Saint John the Baptist. And like the Baptist, and indeed like our Blessed Lord Himself, Father Brusca continues to go before his Lord in readiness to carry out the same mission of the Baptist as well as our Lord. He is the other Christ -- the same, whole and entire, that God has chosen to be his “other self” in a vineyard that has grown both weak and strong in an era of grave contradiction, doubt and denial. I say it is weak because the vineyard has been weed laden with our times. I say it is strong because that same vineyard still has rich soil, abundant fertilizer and a great bounty to be harvested, a vineyard your pastor always stands ready to till. With the twentieth century the Church reached an apex of achievement and triumph unparalleled in her history. All the world looked up to her, even her enemies. But toward the third part of that century, she faltered. She slid back. She failed to have only the vision of her spotless Bridegroom before her. She faltered and she slid back, but she has not become completely fallow. Father Brusca, and the other good priests of our time will continue to struggle to regain her pristine beauty, just as faithfully and slavishly as did the Baptist. No priest can ever carry out the mission entrusted to him by Christ without good, caring parishioners. Indeed, no priest really has a mission without God’s children. As children of the divine Master you must continue to be ever as vigilant in keeping God’s commandments, as is your priest. You must continue to be as caring and concerned about your pastor as he is of you. Not a day of your life should go by when you do not personally go to our blessed Lord in humble prayer for the man who nourishes you every day with the bounty that comes to you through him from Jesus Christ our Lord. From time to time, you should shower your priest with the collective spiritual bouquets, combining your Masses, your Communions, your rosaries, your stations of the cross, your limitless ejaculations of petition before the throne of God in his behalf. No priest can survive without your personal nourishment of him. While you will never be able to nourish him with the Sacraments, as he is able to do for you, you can nevertheless, storm heaven for him ever as frequently as your very thoughts of him and of God Himself. You are something of a team here, priest and parishioners joining in unending prayer before the throne of God, working mutually for the salvation of your souls. And there are thousands, maybe millions of souls “out there,” who can also feel that same spiritual nourishment through your good example and your Christ-like way of prayer. Treasure what you have here, a kind of pot of gold, an oasis in the midst of a sea of indifference, at best, where Jesus Christ awaits your coming to visit Him here in the tabernacle, where He ever remains as your Friend, a friendship kindled or rekindled and constantly nourished by a priest who gives you every bit of himself in the sublime character of the other self of Jesus Christ our Lord. Without Father Brusca most of you would be hanging on the gibbet of spiritual decay and total emptiness of all that Christ has to offer you. That comes to you only through the unselfish spirit of this priest who has now walked among us for a quarter of a century. Let us offer our Te Deums, not just today but every day. May God bless Father Brusca and may God bless us all. Amen.